Eatonton-Putnam County offers new and expanding businesses a healthy, economic landscape supported by a business-friendly environment. 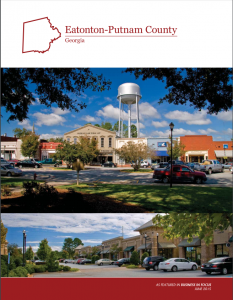 Putnam County has earned the designation of an Entrepreneurial Friendly Community by the Sate of Georgia, a recognition which is designed to facilitate small businesses in reaching their potential. Eatonton-Putnam County has grown from an agrarian past into a broader business climate to include manufacturing, tourism and retail. Our community offers a prime location which combines business and quality of life, with diversification being key to Putnam’s sustained growth patterns. An appreciation of home and a pro-business climate are key factors of a successful economy in Eatonton-Putnam County.Our community maintains a thriving downtown shopping district which lends support to the two industrial parks located within the city limits of Eatonton and a third privately owned one close to Lake Oconee. Additional retail, dining and lodging options are located throughout Putnam County from Lake Sinclair to Lake Oconee. The people who call Putnam County home are part of a lively, active community, which hosts many annual events and festivals. Family, friends, neighbors and visitors enjoy a variety of entertainment throughout the year. Opportunities for recreation are abundant in Eatonton-Putnam County too. From a day on the lake to a day on the golf course, it’s easy to enjoy the great outdoors in a variety of ways. When hunger strikes, a delicious variety of restaurants welcomes you. With quality health care and a great place to learn, come to visit or stay a while. We invite you to explore visiteatonton.com to experience the quality of life in Eatonton-Putnam County. Total Area: 345 sq. mi. Putnam County pulls from a labor pool of over 67,775 employees in Central Georgia. The Hartsfield-Jackson International Airport, the busiest airport in the world, is 78 miles west of Eatonton and the Port of Savannah, the 4th largest sea port in the U.S., is 185 miles south-east via 4 lane highways.